centimetre steps, or turn left or right by 90 degrees. Then, you press the go button to watch the robot move. Bee-Bots robots are very robust. We started out with 6 and then I purchased another 6. Then at the start of last year I made a very bad purchasing order, and purchased 6 Blue-Bots with a charging station. I made this purchased based on two reasons. Firstly, the Blue-Bots came with a charging station which meant I didn’t need to buy batteries for teachers and they’d be better for the environment. Secondly, I thought they would good because they were advertised to be innovative. Blue-bots use Bluetooth and “can be controlled using a tablet or PC/Mac whereby you create your program on screen, send it remotely and see Blue-Bot performs your program right before your very eyes!”(source withheld). Hence, I thought we could utilise the apps on our iPads and extend our students. Wrong, very wrong. Firstly the Blue-Bots are extremely hard to connect via Bluetooth, not only causing frustrations for teachers but students alike. Secondly, within a year 3 have stopped working. The motor in their wheels is very poor and they simply don’t move anymore! Conversely, our original 12 Bee-bots have lasted between 8-6 years and they are still going! So this year, I purchased another 6 of the original Bee-Bots with a charging station, making our total 24, well really 21 as 3 Blue-Bots are not functioning. Anyway, I’ll get to my blog topic, ‘Bee-Bot ballerina’. One of our Reception teachers, Jo Szegedi has been the founder of our Bee-Bot program. We use them to teach students how to follow, describe and represent a sequence of steps and decisions (algorithms) needed to solve problems (ACTDIP0040). 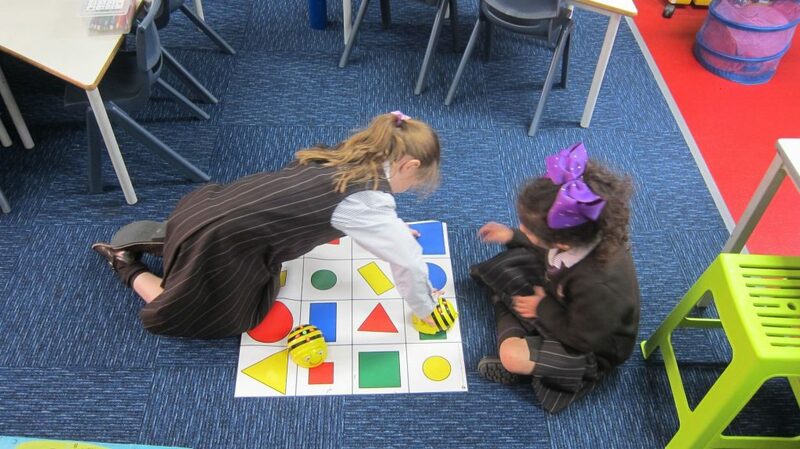 Initially students are given a range of Bee-Bot mats and asked to program their Bee-Bot to reach a desired location without picking it up. At first, this involves a process of trial and error. However, as students learn programming instructions they are then encouraged to predict and record their Bee-Bots code. 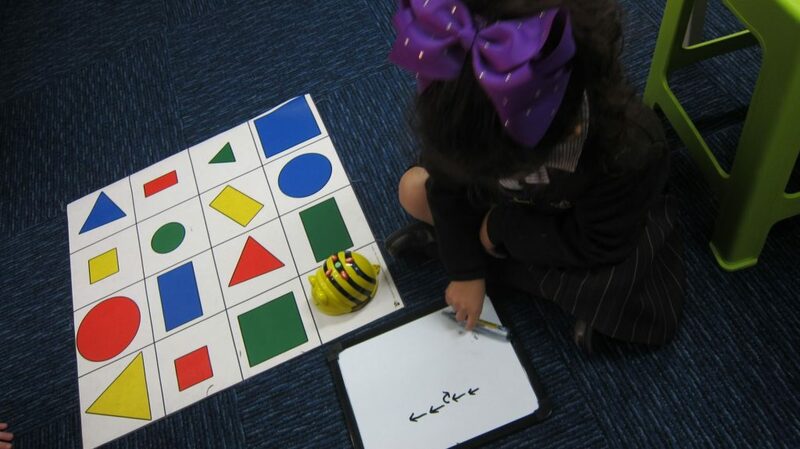 For example, in the picture below, the student was asked to predict and write the code for the Bee-Bot to reach the green circle. Jo found that this year students were reluctant to record in their books but they were more than happy to record on a whiteboard. I still haven’t got to Jo’s Bee-Bot ballerina concept yet. Before I do, Jo also mentioned that she like to get students to work in pairs. One partner writes the code (Bee-Bot movements) and the other partner needs to predict where they think the Bee-Bot will end up. Then the partner runs the program and finds out if they were right! So now for the Bee-Bot ballerina concept. 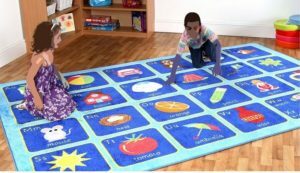 For the past 5 or so years, Jo has had various floor rugs in her classroom which have a grid, something like the one below (image LINK but note, I am not promoting any particular product, just an example). Using a rug like this, she could stand in a square and show students that a Bee-Bot turn was a 90 degrees turn on the spot, not a Bee-Bot distance movement. However, now she has a plain coloured rug in her room and was unable to do this. So she came up with the idea of the Bee-Bot ballerina move. A ballerina does a pirouette on one foot, hence a turn on the spot. So does the Bee-Bot. When it turns, it turns direction not distance. Neat idea and the students picked up on this concept quickly.